Over 35 vehicles belonging to U.S. Soldiers were stolen or vandalized this past week at the Army National Guard Armory on Westheimer Parkway in Houston, TX. I encourage the local media to bring attention to this targeting of Texas Soldiers so that the thugs who are doing this will be brought to justice. Over the last 2 weeks, I, along with hundreds of Houston area Texas Army National Guard Soldiers, drove nearly 1000 miles one way in a military vehicle convoy to get to Dona Ana Camp in New Mexico (just north of El Paso, TX). It was our Annual Training. 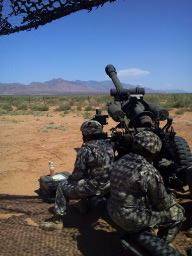 The Battalion that I am a Sergeant of, HHB 1/133rd FA, is a Field Artillery Unit. We camped out in the desert for eleven days, and part of our Battalion mission was to shoot three thousand 105mm rounds into a nearby mountainside. While we were away training, thugs vandalized and/or stole at least 35 vehicles belonging to my fellow U.S. Soldiers at the Houston, TX Armory on Westheimer Parkway. Many of these soldiers have deployed to Iraq and/or Afghanistan multiple times. Thankfully, the armory that I was parked at in North Houston was not hit by these thugs. This is not the first time that this has happened either. This has happened in the past in Houston, TX while soldiers were away for annual training. This is troubling because it means that this is not a random event and there is a group of thugs who are specifically targeting U.S. Soldiers in Houston, TX. This group knows that National Guard Soldiers go away for 2 weeks every summer for annual training. They know that the vehicles of training soldiers will be in the parking lot for 2 weeks. They find out when the annual training is and they victimize U.S. soldiers once they leave. This is despicable. I encourage anyone with knowledge of who did this to please call the local authorities.